With the 2019 World Junior Championship getting underway Dec. 26, NHL Network will be televising all Team USA games of the tournament and 28 games in total. While familiar faces Dave Starman and Jill Savage will be returning for another year of coverage together, the man assuming the reigns on the call is primed for his first tournament. 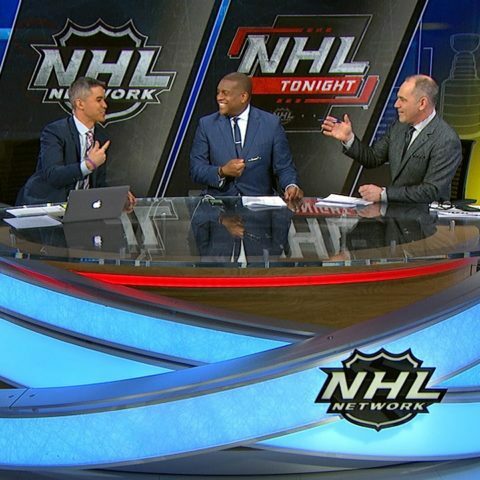 NHL Network’s Stephen Nelson will not only provide play-by-play coverage, but he is earnestly intent on bringing at-home viewers a great deal more. Tuning into the 2019 World Juniors will be a full package with him manning the booth. THW caught up with Nelson for an exclusive interview just before he made his way out to British Columbia. NHL Network’s Stephen Nelson will be providing the play-by-play work for their coverage of the 2019 World Junior Championship (Photo provided by NHL Network). Originally from Southern California, Nelson’s sports knowledge and involvement has been all-encompassing. 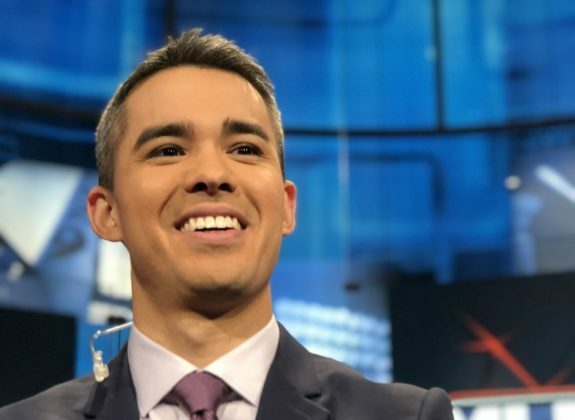 In addition to his work with NHL Network, he has performed duties as a studio host for MLB Network, including their regular season studio show “The Rundown”. Nelson has provided extensive coverage during his career for both the University of Oregon Ducks and the Oregon State University Beavers. Additionally, he has worked as a studio host, color commentator and play-by-play broadcaster for the American Hockey League’s Rockford IceHogs. The 2019 World Juniors are hosted by Canada and will be taking place in the cities of Vancouver and Victoria, British Columbia. With some variance in participating teams from year to year, and a far greater one for every team’s roster, there is a sizable amount of prepping and studying that is done by all who are involved with covering the tournament. Nelson is no different. In fact, he considers his prep work to be something he excels at and is very meticulous about. Rest assured that he has done his homework for 2019’s tourney. He also exudes a penchant for accuracy within his work. While recognizing that he may end up only utilizing a small portion of the facts and information he has gathered, Nelson also understands that small tidbits can be paramount in making or breaking the coverage of a game. In addition to great hockey, fans enjoy tuning into the World Juniors to learn the stories of the players. There are always “feel good” moments at each year’s tournament or an interesting side story to be sure. For a broadcaster, little nuggets or facts can be invaluable. While he may be a “West Coast boy” himself, venturing up to British Columbia will be a new experience for Nelson. Vancouver and the region surrounding it are known for being picturesque and a more than a bit awe-inspiring. The 2010 Vancouver Winter Games showed us that for sure. Nelson is excited about not only taking in one of the premier tournaments in all of sport, but to do so in such a scenic locale. In some ways, the fact that the World Juniors are in British Columbia further accentuates the splendor of it all. “Just to experience the atmosphere,” Nelson responded when asked what he was most looking forward to about the tournament. “Being a hockey fan, I’ve always known what the World Juniors is. You watch the games and the highlights, and you see it on social media. You know that all of the big names who are now in the NHL come through the WJC. To have an opportunity to one, go to a place I’ve never been in BC – which is by all accounts one of the most beautiful in North America – and then also see this next wave of prospects. As a hockey fan, that gets you pretty fired up. Being witness to the prestige in person. That is something that I never really thought I’d have the opportunity to do, for the fact that it’s now here in front of me. Trying to take the bull by the horns, forgive the cliché, and soak up everything that it’s worth”. Having seasoned counterparts is critical to ensuring success as a first-timer. Nelson is very enthusiastic about having the opportunity to share the World Juniors coverage with Dave Starman and Jill Savage. Starman has been part of NHL Network’s coverage of the tournament for over a decade, and has additionally served as a pro scout for the Montreal Canadiens. Savage has been covering World Juniors for about half as long and is widely respected for her ongoing work. Both individuals are more than capable of putting a newcomer more at ease. We've got #WorldJuniors predictions from @brianlawton9 and @DStarmanHockey! Nelson knows that he can work cohesively with his partners to present the tournament in a different style with the viewers this go-round. He wants to give more to the entire experience than just play-by-play. In Nelson’s mind, he and the audience are on this journey together and it is a two-way street. The 2019 IIHF World Junior Championship is being played in Vancouver and Victoria, British Columbia, Canada (Photo provided by NHL Network). The 2018 World Junior Championship in Buffalo was very bittersweet for American fans. Team USA took home the bronze medal on home ice, won an outdoor shocker of a game against Canada at New Era Field, and saw their own Casey Mittelstadt be named MVP for the tournament – but – none of those equate to a gold medal. Their neighbors of the north – Team Canada – were the ones who went home with the gold packed away in their luggage. Now a year later, and the turnaround of the tournament being played on Canadian ice, could there be a “returning of the favor” so to speak? USA captain Mikey Anderson, Quinn Hughes, Ryan Poehling, Josh Norris, and Dylan Samberg were each members of the 2018 bronze medal-winning squad who have returned for 2019. While there may be a sense of unfinished business, this tournament is not about retribution or anything of that sort. Rather, the Americans are focused on grabbing the gold no matter who their opponents might be. Kazakhstan has not been in the top division for an IIHF World Junior Championship since the 2009 tournament in Ottawa. With a decade having gone by, they are not a national team that North American fans are accustomed to seeing, as they have been relegated to either Division IA or IB play for quite some time now. They also will have their work cut out for them, as Kazakhstan is in a heavily stacked Group B along with USA, Sweden, Slovakia and Finland. Though no matter if we are talking Kazakhstan, the United States, Canada, or any other nation represented in this tournament, it is of the utmost importance to Nelson that he demonstrates both respect and openness to his audience while covering the games. This is what international competitions should be all about – uniting for the sport that we love while exemplifying the best in sportsmanship. Stephen Nelson (seated left) is intent on making the NHL Network’s coverage of the 2019 World Junior Championship more interactive with fans (Photo provided by NHL Network). We have already been seeing inclusiveness and growth within the United States game. Players from many nontraditional hockey markets are finding representation on the USA National Junior Team. This is a fact that has not been overlooked by Nelson as he begins his coverage of the tournament. You will not want to miss NHL Network’s broadcast of the 2019 World Junior Championship. Stephen Nelson will be doing his darndest to ensure that it is an engaging, enjoyable event for all viewers. He has some good friends that will help him out too., in Starman and Savage The World Juniors are a tournament that never disappoints when it comes to the hockey being played. Over the years there have been numerous memorable moments. But, it is always a more flavorful and inspiring affair when there is a voice like Nelson’s that is helping to guide the viewers along. From his perspective, strong social media coverage all tournament long is critical as well.